Karl Smith Interesting. That's exactly what mine was doing, but mine was intermittent. It seems yours is more of a consistent thing. I'm wondering if my remote will get worse over time? Did yours just start doing this? This weekend was the first I've noticed it, and rebooting the remote seems to have fixed the issue, at least temporarily. Any ideas whats wrong with our remotes? Travis Ballstadt Karl Smith Thank you for reporting this. 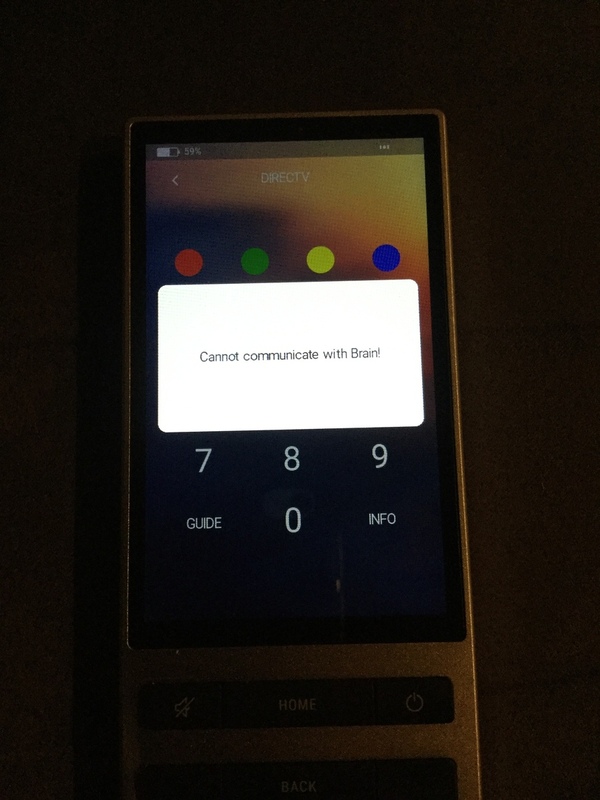 On which firmware are you running on your NEEO Brain and NEEO Remote? Was the remote on the docking station before this happened? Does this flickering occur after starting a recipe? 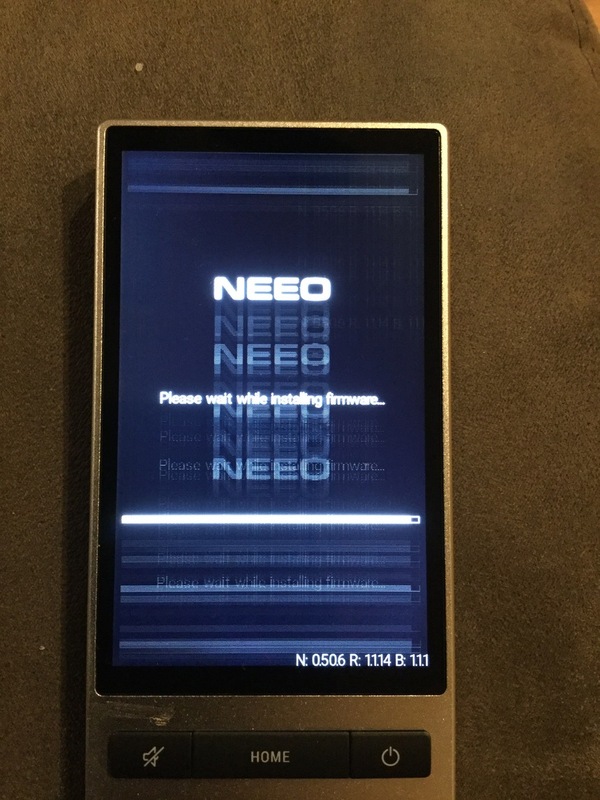 Could you please try to reboot your NEEO Remote once? Ingrid mine was just replaced for the same issue. It happened only after the latest firmware update and only after taking it out of the charging cradle. Rebooting didn’t change anything. Setting the flickering remote down and waiting until the screen turned off fixed it temporarily. Ingrid Ver 50.6 Not on dock, was on table. Flickering at all times. Did reboot. Same. Did recovery. Same. This is the happening on the new remote I just recieved as replacement. I am on whatever the newest firmware version is, from last week. How I know is explained later. The remote was not on the charger. We had just watched a movie, and I was goofing around in the AppleTV menus after the movie when I noticed this. I hadn't noticed it before the movie. After recording this video, I clicked on the remote menu to check for a firmware update. The remote told me it was up to date, but froze on that screen. I was unable to clear the dialog box and get back to the home screen. To get out of that lock, I rebooted the remote and the screen has stopped flickering. It seems I'm not the first to have this problem. Is this something that will return? Travis Ballstadt Ingrid see above. Karl Smith Hi, Karl, I'm very sorry to hear that. Do I understand correctly that the flickering just occurred with your replacement remote? Did this ever happen before? Does it sometimes stop to flicker? Is the remote fully charged? I will check it out again with the developers. Meanwhile, could you please contact support@neeo.com again. I'm very sorry about that. Travis Ballstadt Hi, I'm glad to hear that rebooting the remote solved it for the moment. You are right, you are not the first person reporting this. I have forwarded it to the developers to look into this closer. As we take your feedback very seriously and it helps our developers a lot, please keep me updated on this behavior. Thank you very much. Ingrid This is a replacement remote. I have had it for 1 week. The flickering started spontaneously Sat night. The remote bat was high 90%s. It never stopped at that time. As I still have the orig remote I put that one back in service. The flickering remote has been dropping bat down to 90% and it looks like the flickering has stopped. I will recharge back to 100% and see if flickering returns when i get home. I have already sent Jeff an email about this. That good enough? Karl Smith Thanks Karl, let me know if anything changes. I will also email you a pre-paid label to send back the original remote. Good morning all. I let the remote charge overnight. It was at 100% this morning and no flickering. It is in service today. If it starts acting up my kids will let me know. I have not yet restored a second time. 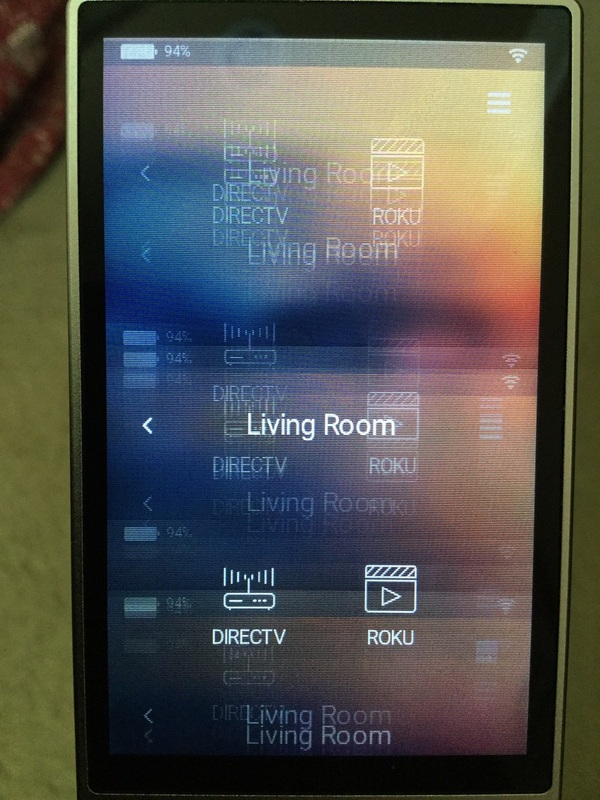 Jeff Ingrid Daughter tells me replacement remote was flickering and glitching all day. I did a restore (power and mute) when I got home. Flickering before but not after. We’ll see how it goes. And my orig continues to shutdown during use. Karl Smith Hi Karl, thanks for the update. Let’s reboot the brain and see what that does. This glitching flickering seems to be isolated. I’ve been running several remotes and brains and I’m yet to experience this. If you can somehow capture footage of this, that would be awesome. Jeff I have tried to upload video. Planet neeo says i cant. Ill send in email. Karl Smith The replacement remote was fine before it was shipped, very strange. Can we reboot the NEEO Brain and if possible a brain reset too. Hi I cant comment on how it was before. But when it got to me it asked to update the moment it finished pairing. Others have noted problem started after an update. Karl Smith Yes, my problem (in the video in the original post of this thread) began soon after an update. However, it has not repeated the flickering since rebooting the remote. Fingers crossed. Anyone seeing my videos? All i get is a triangle with a slash thru it. Karl Smith I'm able to watch it. So it should be possible for other as well. Did you allready force reboot the remote? Markus Mahr Good. I was worried. Thanks for the heads up Karl. I’m going to message you some instructions. Jeff Did what you asked. Both went thru recovry. Both now on ver. 0.48.35. Stable at the moment. But was glitching all thru the process. Brain and remote now updated to current firmware. Screen seems stable. Now remote freezes. I cant win. I tried sharing a video. Planet neeo says its too big. After a long stretch without the problem, it appeared again the other night. It did not require a reboot to correct itself this time, the screen went to sleep and when I woke the device, it was functioning properly again. Could this point to possibly a different problem than we originally thought? i am running the current firmware and software on all parts. Travis Ballstadt Hello! Our dev team is actively looking into this. Let me know if the issue persists :). Have the same problem from time to time since I have the remote (dec. 2017). Several times in a month it starts flickering, but it's not reproducible. Remote and brain have the always newest firmware. Since the last update, I have the same problem. When I start to use the remote, no problem, but after half an hour, I have some flickering and ghost images ont the remote. Very strange, because if I change receipt, it's good again, and after it ghost again too. It's like a refreshing problem. No problem before the last update. Francois Serrault Hi and sorry for the late response. Have you attempted to perform the recovery on your remote to see if this helps? Jeff Hello Jeff. I have made the recovery procedure last night. After recovery, same problem. Always ghost images on screen. What can I do ? Francois Serrault Hello, thank you for the update. Our dev team has identified the issue and applied the fix in the next firmware update. The firmware should be released in the next 3-5 weeks if not sooner. Is it okay if you can hang on to your remote until then? Jeff Hello Jeff, good to hear if it's a firmware bug ! I will wait, non problem (except if I can be a beta tester if you want for that ?). Thanks a lot. Jeff Hi Jeff, have some news ? I always have the same problem. Please Neeo Team, communicate with customers ! Francois Serrault New firmware will be released in the next few weeks. Our team just released a firmware internally that should go to the beta team in the next day or so. Jeff I hope Jeff ! Do you have in the beta team someone with flickering device ? If not, can I become a beta team member ? I know quiet well development (I am a web coder), and can give you some feedback. i just started to experience the flickering issue today, first time it has happened for me and after some searching around I came across this conversation. Is the remote recovery procedure described here latest solution. I tried it but issue still occurring. Hoping the developers might have solved the root cause of this given this thread is several weeks old now and it appears multiple customers have experienced this. Paul Benet Sorry to hear you're experiencing this issue as well. We have identified the issue and fixed it. Next firmware update will include the fix. Firmware should be released in the next 3-5 weeks, maybe sooner. Would it be okay to hang on to your NEEO Remote until then? Jeff Thanks for the reply, I am happy you have identified the issue and solved it now. I can wait a few weeks for the firmware update, no worries. Jeff Hi, it's still the same after the last firmware update ! Always a ghost screen after 10mn of use. What can I do after your new plan with 4control ?